Servatur Exemplar in dedibus - etching from the 18th century. From a drawing by Salvator Rosa. 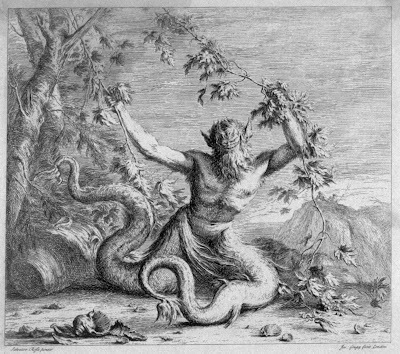 Is the monster Glaucus?- a very similar creature is depicted in the three versions of "Glaucus and Scylla" by Goupy, Rosa and Winstanley in the Fine Arts Museum San Francisco image base. Paul.